Join FSU and our allies this Tuesday, May 8th, from 12-1pm on the campus plaza (by the Iron Worker statue), as we rally to #RESPECTUMB. Join representatives from Faculty Council, the Undergraduate Student Government, our own UMB Deans, as well as the Coalition to Save UMB, and PHENOM as we demand the respect and the funding our campus and its mission deserves. 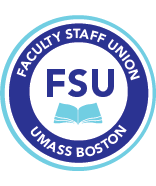 We are the #diversityflagship of the UMass system! The FSU Executive Committee endorsed this action. 1) Halt this UMass - Amherst Mt. Ida Deal! 2) Fully Fund the Boston Campus UMass *already* has: UMass Boston! Please share with students and colleagues!